No illogical dialogue. No annoying voices. No racist accents. All the best visuals. All the best music. An all new script. 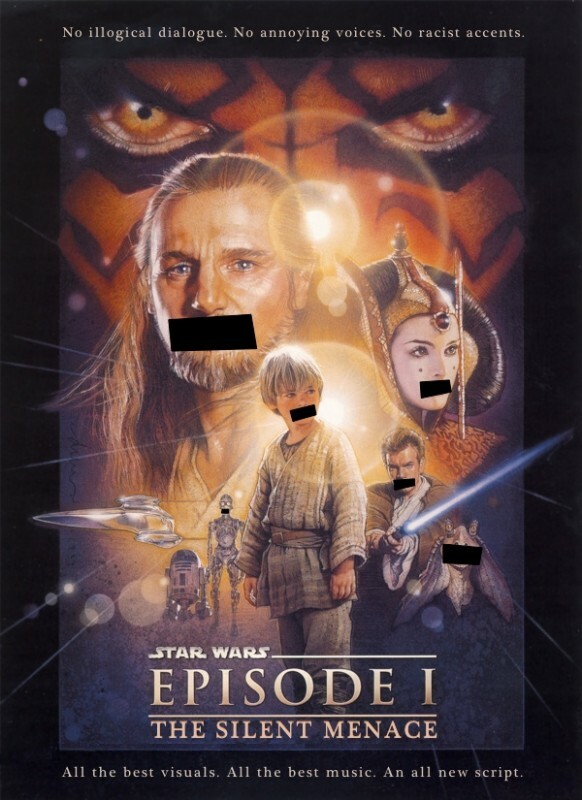 The Silent Menace is The Phantom Menace completely re-imagined and re-written based entirely on the visuals and John Williams score. All dialogue is removed and replaced with subtitles, allowing for a new script, many new story elements, new character development (including backstories for major characters), and new relationships between the characters. Cutting and reordering footage allows for more logical and connected action sequences. The soundtrack is replaced by the John Williams score from The Phantom Menace, plus individual tracks from other Star Wars movies. When watching a foreign movie without subtitles the viewer must re-invent the characters and story in their own imagination. 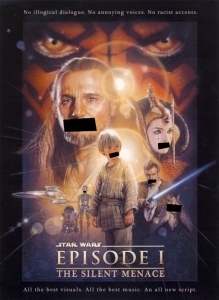 By applying this exercise to The Phantom Menace, I realized I had something in mind far more entertaining than George Lucas's original script. It also fit far better with the themes, relationships and continuity of the Original Trilogy. Entire soundtrack replaced with music from the soundtrack album. All dialogue conveyed with subtitles (almost entirely rewritten from the original script). The podrace includes the sound design from the original movie plus music from the Attack of the Clones and the Original Trilogy soundtracks. Lots of material is cut, and all the action sequences are reordered for better storytelling and logic reasons. In total about 130 hours spent editing. Too many cuts to list due to the nature of the edit. First, I applaud Luke for taking a somewhat bold approach to this edit. He brings some very new and never-before seen ideas to this movie, by rewriting most of the script and adding in new elements that change major elements of certain characters and certain aspects of the plot. Given that this is a slight step above SD, the quality was for the most part excellent. I found that sometimes the subtitles were flying by a bit too quickly, but for the most part, this was not a big problem. This edit is also restricted to non-TV viewing, as the subtitles will be cut off on the bottom on some TVs. Otherwise, the visual editing was very well done. I think the strongest aspect of this edit is the almost complete rescoring of the score. For the most part, Luke has done a terrific job using John William's beautiful music from various soundtracks (mostly from the extended edition of TPM itself,but also from other Star Wars movies). It was a joy to listen to, and he lined it up very well with the visuals. The only issue I have with the audio is that it became inconsistent in two places - the Pod Race and the Obi-Wan/Darth Maul battle, where the movie's sound effects were included. The rest of the movie did not include the sound effects, and thus it felt a bit jarring to have an established convention (the total silence except for a soundtrack) be broken. However, this issue has more to do with enjoyment, and not quality of the audio editing itself, and thus it does not detract from my overall score. The narrative is also one of the stronger elements of this edit, with just a few caveats. There was a real attempt at reworking elements of the original story that either did not make sense or were not well thought out, and changing them into sometimes very radically different approaches. This is what I found to be a very nice addition to the pantheon of TPM edits. While I liked almost all the new elements Luke introduced into the plot in order to make the story work better, I felt the narrative began to suffer as elements (though certainly interesting) would be introduced but not fully integrated into the main story arc. Since a good amount of the original text was still included, the new elements seemed to jump in and out of the original storyline, being used to "fix" plot issue in a more local, rather than global manner, while leaving other elements untouched and less integrated. Enjoyment is of course a purely subjective measure, and I did enjoy many elements of this edit. In the end though, there were a few elements that prevented me from really enjoying this edit as much as I would like. First, the pod race. It feels too long, and also it has the aforementioned sound from the original mixed in, so you hear sounds from the aliens as well, which can be annoying. Second, there's too much Jar-Jar antics left in for my taste. And they really aren't connected or explained at all...they just happen, like they do in the original. Third, some of the new subtitles were not quite as well written as the others (though this is just a handful of them), using modern slang in places that felt out-of-place. And finally, while I enjoyed the narrative more than the original, my only wish was for the new elements to be a bit more "in control" of the main story arc, so that it would have felt more like a fully fleshed out story as opposed to some great ideas (and there are some great ideas here!) that had to compete with the original storyline. Note - My enjoyment rating for the original release of Episode I would probably be around a 4 -- so obviously I think this is a significant improvement over the original! Overall, I applaud this edit for it's boldness, and I think if Luke revisits this project sometime in the future after having more experience, this truly could become something special. And even as is, I think it has some very nice qualities. Nice job, Luke! It fixes Phantom Menace permamently in the most remarkable way so far. The way it converts original bad decisions into good features of the edit, is beyond comparison. Now this movie actually has a story... a story with reasons, emotions, context, depth... wow! I quite enjoyed this, which is saying something considering the source. Haha. ;) (seriously, though, I generally appreciate the movie FAR more in fanedit form) I like the addition of some of the new plot elements, like balance slaves and mind maidens. That led to some fun lines and interesting situations. (and one hilarious revelation!) Overall, the story is easier to follow, which is good. Video quality is nice. The movie certainly has aged better than II and III, but that's neither here nor there. Heh. Not totally sure how I feel about some of the audio choices. As-is soundtrack portions inserted at times do seem to fit or seem almost necessary at times to match the excitement of the scenes, but then that makes it not 100% silent... I guess that's like black and white movies that have color elements sprinkled here and there. There are always TMBTM's silent projects if you're a stickler for 100%. Haha. One negative for me is that I definitely didn't like seeing Jar Jar's old shenanigans intact. It's just that it reminds me of why he was such a hated character in the first place! It's something I could've lived without ever seeing again, but since he's toned down so much overall, I uh...yeah, I still didn't like seeing it. Sorry. :p I also wasn't crazy about a few of the subtitles, as they were extremely "modern," for lack of a better term, but we're only talking about 3 or 4 of them, so that's fine. P.S. Funny cover art. So simple and effective.